We occasionally find nice editorials or letters in newspapers of the colonial era which express a concern for the relationship between England and the colonies. Most appear during the midst of the Revolutionary War, but they can be found, at times, in newspapers dated between the Stamp Act of 1765 and the outbreak of war ten years later. 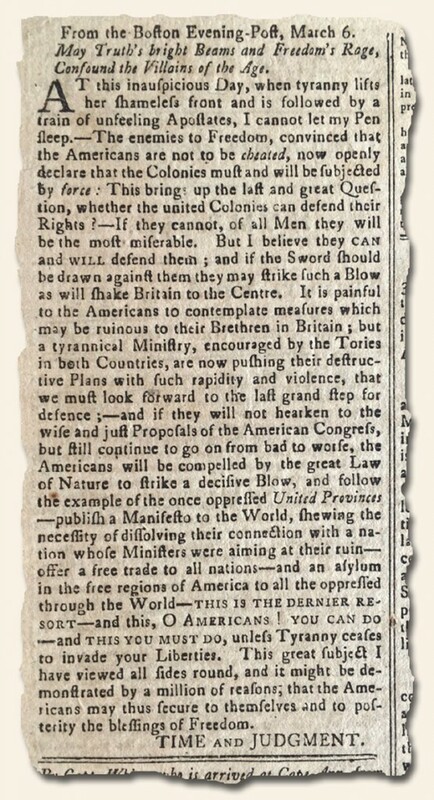 The “Essex Gazette” of March 14, 1775 contains on page two a very rousing “call to arms” in support of freedom from the “tyranny” of England (one is shown below -both are viewable through the link). Hint is made for the need for freedom from British control some 15 months prior to the Declaration of Independence. Take a moment to read this great letter, headed: “May Truth’s bright Beams and Freedom’s Rage, Confound the Villains of the Age.” A very appropriate piece as we now celebrate the 239th anniversary of the Declaration of Independence.